Articles published in the «Arterial Hypertension» journal discuss a wide range of contemporary issues related to hypertension from the basic studies of the pathological processes behind hypertension to drug clinical trials and guidelines for cardiologists. Alexandra O. Konradi — MD, PhD, Professor, The Deputy Director General of Science, Federal Almazov North-West Medical Research Centre. 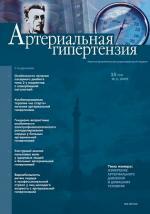 Vitaly A. Tsyrlin — Professor, M.D., Ph.D. Assistant editor of the “Arterial Hypertension” journal. Baranova E. — MD, PhD, Professor (St Petersburg).